Venti Group announces The New CORE™ Low PIM Rated Dual-Polarized Omni Ceiling Mount Indoor DAS Multi-Band MIMO Antenna, supporting 698 - 2700 MHz, 3.0 - 3.6 GHz and the 4.9 GHz Public Safety Bands. The CORE™ True Horizontal & Vertical MIMO Antenna delivers up to 72% greater throughput over an all Vertical MIMO. Venti Group is taking orders now for immediate delivery. Venti Group develops and owns patented antennas (CORE™ line of horizontal and vertical polarized antennas), coaxial sleeves (SLEEV™ line of passive radiation suppression for coax & cables) and PIMCONNECT™ (manufacturing techniques for reducing PIM in antennas) technologies. Venti Group currently holds eight (8) global patents, with an additional eleven (11) patents pending. 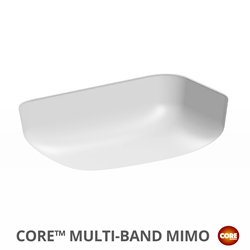 The New CORE™ DAS Multi-Band MIMO Antenna delivers unparalleled performance by utilizing true polarization diversity and a Low PIM Rating of -153 dBc or better across all frequency bands. The CORE™ DAS Multi-Band MIMO Antenna leverages several of our patented technologies including the Venti Horizontally Polarized Antenna, SLEEV™, and PIMCONNECT™ resulting in unmatched performance and an industry best PIM Rating, essential in Distributed Antenna Systems (DAS). Finally, a True Dual Polarized MIMO with a Vertical and Horizontal Antenna is available at a list price of $149 for immediate installation for in-building DAS systems. The CORE™ DAS Multi-Band MIMO antenna is available in the iBwave database. Venti Group is a Manufacturer and Licensor of Antennas, coax RF Suppression Sleeve and PIM Technologies. Venti Group independently develops and owns three Wireless Patent families - CORE™ Antenna, SLEEV™ and PIMCONNECT™ Technologies. CORE™ Antennas are a Patented Low-Cost Antenna Technology. CORE™ Antennas is a line of Indoor and Outdoor Wi-Fi and DAS Antennas. Venti Group is committed to bringing our technologies to the Wireless World to enhance all communications with greater coverage along with faster and more reliable data.